A laminating machine can add the finishing touches to premium products. Running a successful print shop doesn’t involve just printing pages. What if your customer wants to bind them, or take them somewhere else for mailing? Having a couple extra machines around the shop will provide your business with some valuable revenue opportunities. Here are a few services you should consider adding to your shop to increase profitability. A UV Coater gives your print shop the ability to apply hi-gloss, satin or matte coating to just about any printed sheet. UV Coaters come in a wide range of configurations and sizes, with modular designs that allow for added components like automatic feeders. A UV Coater is also an environmentally friendly method of applying finish to your printing. One line of UV Coating is even 99.9% VOC free — making this service the perfect sales pitch for green-minded customers. Every office needs to send mailed statements, invoices, and other marketing material. That’s why you should consider adding a letter fulfillment service to your shop. Automated letter folding machines make traditional envelope mail-outs easy and efficient, regardless of the volume. Binding machinery is low-cost and an absolutely critical component of any successful print shop. You can prepare presentations, books, newsletters, or proposals to the exact specifications of your customers. Whether it’s high or low volume tasks, comb, coil, or wire bindings — a binding machine can get the job done fast. If you bind it, they will come! If you’re going to be doing folding projects, the next logical step is to run an inserter. An inserting machine can save a ton of time and money by speeding up mail processing. Inserts and pressure sealers keep everything in a neat sequential order so that they’re immediately ready for outgoing mail bins. 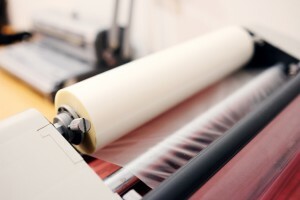 Laminating machines are like life insurance for paper — they make any printing project durable and professional enough to last the ages. By adding a thin laminate coating you can prevent ink cracking and insure the quality and lifespan of your work. Customers are easily impressed by laminated work, making it solid upsell for projects like photos, charts, posters and signage. This entry was posted on Wednesday, August 10th, 2016	at 8:53 am	and is filed under Printing tips	. You can follow any responses to this entry through the RSS 2.0	feed. Both comments and pings are currently closed.